Greetings friends! We just got back from our wedding filled weekend and it was, as expected, much fun and very tiring. I had a lovely time catching up with good friends and admiring two beautiful brides on their big days. They were two very different weddings, but both equally lovely. This is a tale of two weddings. The first wedding we went to was Friday afternoon and was the wedding of many random acquaintances. The bride is a good friend of mine from theater, but also a Reformed Presbyterian pastor’s daughter and a member at the church of family friend. So there were several random families that we happened to know independently of the couple, which is always interesting. The wedding took place in a beautiful church and was a very traditional RP service, complete with Psalms and everything. (Side note, I super wish I had included Psalm singing in my wedding.) The bride wore a beautiful strapless gown with many layers of sparkly tiers down the skirt. She was absolutely lovely and super cute with her dashing groom. This was also the wedding of many siblings as the bride is one of five girls and the groom one of three boys. I enjoyed the service for it’s traditional elements. The message by said family friend, was lovely and I love any excuse to sing the Psalms. My favorite part, though, was watching the bride. She’s this wonderful, bubbling creature with a very expressive face. Her joy spilled forth from her smile and her eyes as she bounced and giggled and nodded and emoted in basically every way possible during the service. She and her now husband are so much fun to watch together. He’s much more chill and just kind of roles with whatever she does. A light reception followed at which my husband and I joined my theater family at our very own table. There were candles on the table, which inevitably means wax was played with and place cards were burned. That is how the theater people do. But seriously, it was lovely. The reception was held in another part of the church so the room was lovely, music played in the background, but not too loudly for conversation to take place, and there was some very yummy food served. It was awesome to see my theater friends, to hang out and chat and remember all the good times at Geneva. The whole affair was elegant and classic and a little quirky and super cute, just like the happy couple. For our second wedding we adventured out to the east side of the state to a little campground near Philadelphia. It was a nearly five our trip and half way there my husband realized that his dress shirt was still hanging in the bedroom where I’d put it. No big deal, we thought, we’ll just grab one at a Target or Walmart or something when we get there. We had budgeted an extra hour to check in and get changed at the hotel before going to the wedding. That would have worked out just fine had we not missed our exit. Neither of us was paying attention until we noticed the our ETA had gone up by half an hour, and we should have been at the hotel already. So instead of comfortably grabbing a shirt and changing at the hotel, I changed while he ran to Target and back with a shirt to throw on before rushing out. We still made it to the wedding on time, despite our adventures. I’m pretty proud of us. 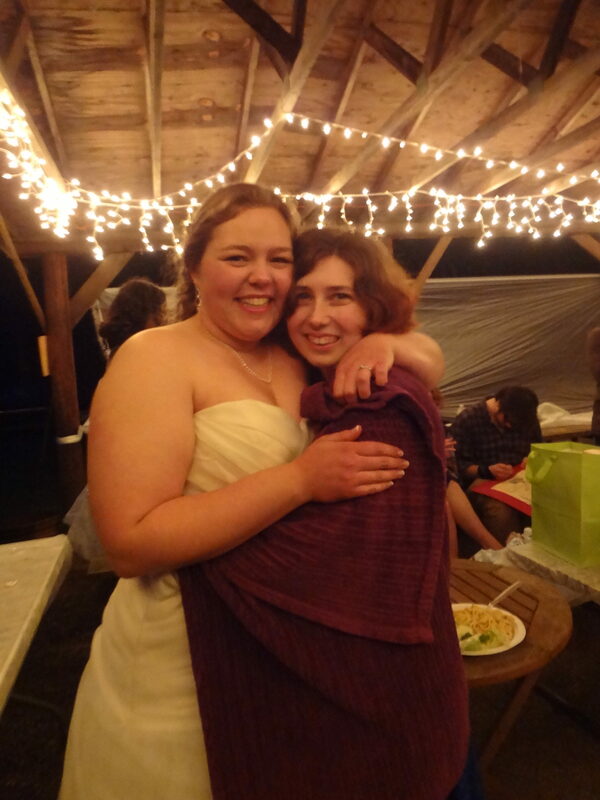 This wedding was for another Geneva theater friend, and it was lovely in a very different way. Sure, it was a little bit of a mess with a downpour of rain starting promptly at the same time as the ceremony, but that didn’t dampen anyone’s joy. We sat in a beautifully decorated pavilion at picnic tables and watched the bride and groom tie the knot in a very short and sweet ceremony. The bride wore a gorgious strapless gown with lots of ruching and some lovely bead work. She was completely stunning. After the ceremony, there was a little bit of mingling, some retrieval of tables from the rain, and some appetizers set up before the happy couple wandered off to take pictures. This wedding was nice because it was so casual and moving around was super easy. I got to wonder and catch up with more friends from theater and enjoy time chatting freely. There was some good food and lots of good friends and it was all super chill. The rain let up after a while and it dried up enough to actually get a fire going, which a few people spent a good deal of the evening attempting to do, before finally succeeding. We roasted marshmallows, which is my favorite, and laughed and had a lovely time. The whole affair was super simple and lovely and cool, just like the couple, who basically did the whole thing themselves. My one lament for the weekend is that there was no dancing. At both weddings dancing was planned, but fell through due to varying reasons. Don’t get me wrong, I had a lovely time at both, but I do so love to dance. Perhaps I will have to organize a dance party to make up for the lack of dancing I got to do with my friends. At any rate, these were two very different weddings, but each was beautiful and so perfect for their respective couples. I love how weddings can embody the people they celebrate. It made me so happy to see these two beautiful friends of mine off on their own adventures in marriage and I wish them both the very best.